This jacka$$ is the top political analyst at FOX News – the so-called “conservative” channel. And FOX just gave this anti-Trump clown his own show! Anti-Trump FOX News political analyst Chris Stirewalt told America’s Newsroom on Friday that Trump would not be the Republican nominee if he wasn’t the leader of the BIrther movement! Chris Stirewalt: This was, never forget, this is a tricky dismount for Donald Trump. He would not be the Republican nominee had he not been the leader of the birther movement in 2011. And if he had not had this set to President Obama about it, he wouldn’t be where he is today. But he can’t get to where he wants to go and stay as a birther. So I think what you’ll see today is him basically do what he did for mass deportations for immigrants, do what he did with his endorsement of Paul Ryan and other Republican leaders where he’s going to say one thing with his words but the Trump tone and the tenor and the eyes are going to tell his base supporters he’s not changed a bit. 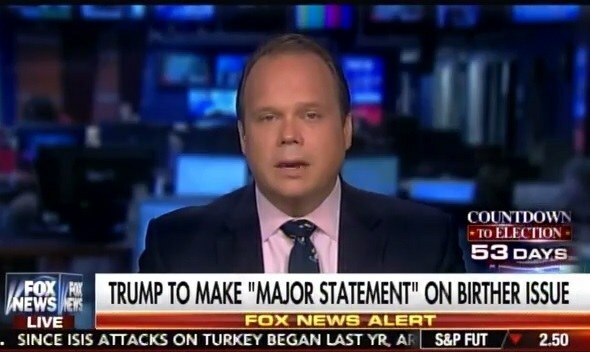 Stirewalt believes Trump won the GOP nod because he’s a birther! Stirewalt has been wrong all year on Trump and the election but FOX News awarded him with his own show starting this weekend. FOX hates their conservative viewers. Roger Ailes, you are missed.